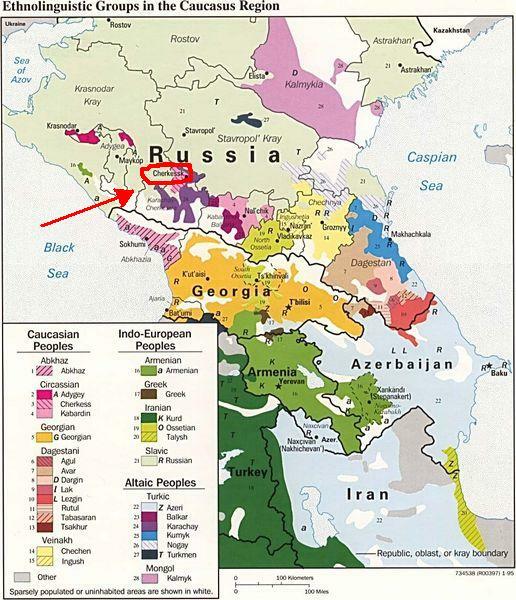 My story begins in North Caucasus; Aly Ramzy Janbek was living in a village called Hattu Chukway near the Great Zelencuke River and the city of Cherkessk (check the attached map). In September 1868, he decided to go to Mecca along with his father for the Muslim pilgrimage. On their way back home, they passed by Egypt and had the privilege of meeting Khedive Ismail. Caucasians were famous for their fighting capabilities and they had always a special treatment in the armies. So the Khedive advised the young man to enter the military academy. At that time, the Caucasian war had ended and many Caucasians were fleeing from their homeland to Turkey and the Middle East. So it was no surprise that young Aly accepted the Khedive’s proposal. Time passed by, Aly Ramzy moved from the army to the Khedivial guards. After the British occupation in 1882 and due to the militarily layoffs, he was transferred to the ministry of interior in the Sharkeya province where he was residing. This was the chronicle of my family’s origin. My grandfather has kept contact with some of his cousins who lived in Jordan, but unfortunately it gradually diminished. I also found a website about Janbek in Turkey, I tried to contact the author but in vain. I am not Alex Haley searching for a Konta Kenti story 🙂 , but I can’t deny that it is one of my dreams to visit my great grand father’s homeland or to contact some distant family members (maybe one day someone will hit the search bottom and find this post!). Thanks Mabrouk for encouraging me to write this post, you made me sit with my father and document the details of my ancestor’s life. And isa I will follow up with more on the ciracassian history, traditions and photos. We may even get the chance to know more about their presence in Egypt (either in the modern era or the mamluks era). If anyone has more info in this regard or is a descendant from a circassian family, please share with us your story. my mother is a Janbek. my grandfather, Ismail Janbek was born in Nalchik in 1900. he was orphaned as a baby and lived between turkey, egypt and then settled in Jordan. He originally settled in Na’ur. But when he married Inaam Khirbiz they moved to mafraq near in the north of Jordan, then moved back to Amman where he was the head of the Iraq Petroleum Company. are you familiar with any of this? If so, i’d like to hear from you. p.s. where are you based? Zeina, Ismail Janbek is actually my grandfather’s cousin !!! I have been searching for so long about him, thank God you were able to reach this. WOW I am soooo excited about this. sadly enough i dont have all the details you have about ur family, all my life i’ve been intrested in adiga khabza and how they lived and there culture, and recently from my dad i found out that we have circassian origin but like most egyptians i have no idea where or how, all i know is that the blonde hair and blue eyes of m grandfaather are defiantly not arab or turkic or european. i’m still trying to find out more about my history but looks like its gonna take alot of time to find my circassian roots. Hey Ibrahim, I am very interested to know about what you have reached while looking for ur origins? hey there I am descendant from aly ramzy Janbek I am Egyptian so we must be related, my dad went and visited the homeland at the time of the soviet union. I know aly ramzy’s story but I thought he came to apply for el azhar university and the khedive offered the military position instead. he also went and fought in mexico right? aly ramzy mirza janbek to be exact right? Do yu know what is same ? or different..? Well I know that my Janbek is a caucassian, not a kurdi. I am searching for the current name of the village my great grandfather came from. Are u sure about this kurdi origin? Do u know which generation brought ur Ganbeg to Turkey? Or do you from which city does it come? I found a website: http://www.geocities.com/jambechs/ , they are in Turkey too. It seems that Janbek / Jambech / Canbeg was a popular name! al calls janbeck or canbeg this only a pornonsiation problem but they are sam call..
hey farooq the descendants oof salahhaddin el 2ayoubi are kurdish circassian/ salahdin father was kurdish and his mom was circassian. his descendants usually carry the name baroudi they are foundin syria and egypt my cousin is decendant of salahdin from his father’s side and his last name is baroudi and from his mom’s side he is janbek but before that I don;t know of anytime a janbek mixed with an ayoubi. came across this by chance, so I thought I ought to drop you a line. I am a janbek, and I actually met some of your family when I was very young. I asume that you know all the relatives in egypt.We actualy lost contact with the relatives in egypt some time ago. I am from jordan. I am not a big fan of the public domain, so you can e-mail me for more info if you like. Hi Angela, long time no see, couldn’t find you on face book! too many ( angela beresford’s ). just saw this by chance, well two years late! drop me a line if you get this, would be great to catch-up. Hope you get this ! Ismail Janbek is my grandfather (hi zeina 🙂 ) . i know that he has brothers and cousins residing in Egypt. i think Mousa Janbek might be a name i recall (ill have to check with the family) but itll be good if we can get some more info on the family and their location. I am also in jordan. my name is mohammed hussein,i am 20years ,i am areal muslim brother.i was born in islam brought up in islam, islam is my religion and i am sertisfy with it because is the only way to sucess. I am one of senega muslim association,i am crying for help,i left my country with a good friend for a mission in ivory coast ( cote d’ivoire).when we got there,we found everything difficult and we entered there during the war while my only good partner was shut to death accidentialy by the millitary people,i only escaped with the power of almigthy Allah.i cry and think everyday about him but crying and thinking cannot bring him back to me,Allah giveth and taketh. please i realy need a help to go back to my country to relocate my relatives because they still have political problem here in this country and i don’t want to die here,i have no familily,brother,sister or relatives, please help me because of Allah the possessor of total power,sovereignty,magnificence and grandeur,the best of creator,as none has the right to be worshipped except Allah without partner and i bear witness that mohamed (may Allah send prayers and peace upon him ) is his slave and messanger. I’am suffering a lot,no job,no accomodation,in fact i’m realy tired of here,so i want to go back to my home to relocate my relatives and continue my education and religion with good health.i have no other means that is why i’m crying for help because i believe begging is better than stilling or rubbering,i prefer to beg than to still. so please help me with anything Allah provide for you,Anybody that help me today may Allhah blees him,bless his home,provide him more and replace for him a better.for those who not capable,may Allah make them capable and provide for them good thing in life (AMEN). Actually I am very interested in checking my circassian heritage, I know that in Jordan there are many circassians who still maintain their language, traditions and customs,,, And I am so happy about this. The Circassian presence in Egypt dates from 1382 and the accension of Sultan malik el zahir Barkuk. He established the Mamluk regime of the ‘dawlat el jarakisa fi misr.’ In the 19th century Mohamed Aly had ended Mamluk political power with their massacre at the citadelle in 1811. In 1821 the Egyptian Nizam el Gedid (modern conscripted army) was organized, its first officer cadre of 1,000 young men was drawn from amongst the apprentice Mamlukes under going training in the Mamluk households of Cairo in 1811, and were spared their lives due to their young age. In the 15th – 19th century the Cherkess, the Akrad, the Bosnians, the Arnauts were all peoples considered to be part of the ahl el seif, I.e. those most competent to bear arms on behalf of Islam, these peoples kept this privilege as a closely guarded ‘trade union’ and later, in the 19th century with the advent of large conscripted armies in the Dawla el Osmanieh, these were the peoples who dominated the officer corps of the militaries both in Istanbul and in Cairo. 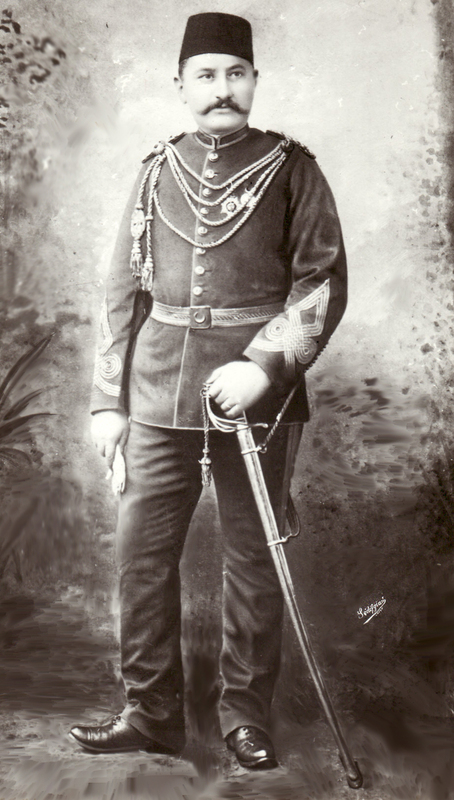 The Egyptian army officer corps at the time of Khedive Ismail was probably about 65% of ahl el seif origin, and of that at least 50% of Circassian origin, many the descendents of the original ‘mamluk’ officer cadre of the 1821. In addition Mohamed Aly had pursued a policy of offering sanctuary in Egypt to the families and younger members of many of the Circassian tribal chieftains (1835-1860) during the period of the Russian wars. There were also many who came through Egypt on their way to haj or studying at the Azhar, these were always given an open welcome by the authorities, many of whom were also of Circassian origin, and also given that the needs of the state for loyal and competent officers and administrators preferably from the ranks of the traditional ahl el seif peoples. Quite a few of the zobat el ahrar were of this origin, but after the events of 1952 it was not pc to claim any origin other than that of Egyptian fellah, so much of the knowledge of their origin and background became subsumed in Egypt’s urban culture. Quite a substantial proportion of Egypt’s urban, muslim bourgoisie is of this origin. i work in project care with the family history in Egypt so if any one have old photo for his family . I too am of Egyptian-Circassian origin and have gone through all the searches you have been through some years ago (a priviledge of older age, I suppose). According to a turkish researcher, there were prior to 1952 some 15 to 20 thousand members of the Circassian Association in Egypt (Gam3eyet al Ikhâa al Sharkasseya)in Cairo and Alexandria alone. The association published a monthly journal, financed publishings about the circassian history and provided funds to educate young Caucasians in Egypt (mainly Al Azhar). There was even a football team called KafKas. I am very glad egyptian circassians are taking pride in their heritage and are looking for more information about it. We are all very proud of our adopted and native homelands but do not forget our parents and ancestors. hi all Aly Ramzi Janbek’s pic i have seen it at one of my relatives in jordan. arabs, turkeys, caucasions and a great deal of nations carry the same y-chromosom . Hi Nour, Am hoda zaki from Egypt. My grandmother is Madiha Ramzy, the daughter of Aly Ramz Janbek. it would be really appreciated if u can provide me with any informations u have about him, or post his photo. I too am a Janbek. Altough it’s my first name not my last name. I’m a turkish-caucasion from uzunyayla region. I don’t know how or if our family tree is related to the Janbeks but after learning about this, I will try to find out. “Actually I am very interested in checking my circassian heritage, I know that in Jordan there are many circassians who still maintain their language, traditions and customs,,, And I am so happy about this. I have read all of the responses and I am overwhelmed with happiness to see Adiga from all over reaching out. I have met several egytian-adiga who are aware of their ancestry and want to grow and learn in it. Do not forget your culture, it is our source of identity and connection with one another throughout the world. Circassian Day of Mourning is upon us: May 21st, 1864. 145 years after the end of the Circassian genocide, (the largest of the 19th century) the ghosts of our ancestors still call us to our homeland. Let us not forget them or their struggle. Let all Adiga reunite. God bless all! I am form Tyrkey and I Just found out, that we are canbeg. Is it the same as janbek? I was also told that we have an Egyptian ancestor. … I don’t know what to say …. For Arab lands their r two groups of Circassian the first came and started playing role in the late Abassi period as the Mamloki (Mamaleek) period which contained Kudi and Circassian “Kings” .. and Circassian like Al Zaher Beabars, Barquq, Tugoj, and many others .. and they had been fought by Muhamad Ali and many of them had been Killed … the others run away to south of Egypt and Suaed and a few stayed hidden and tried to involve in the community not to be killed … ..
Hi all my mother a janbek . My mothers grandfather had come to Turkey from Egypt.Settled to Gallipoli in Canakkele. hi sergei what was his name was it raslin? hi zakaria.my grandfather name suleyman seyfullah janbek.i dont know anyone from Egypt.heritage sent many years ago from State Egypt.we had one seal. (Aly Ramzy Janbeks seal)..But i do not know anyone.grandpa died was a kid my mother. (1949 or 1950).so my mother does not know anybody. our website http://janbek.net … janbek family only, please. I’m Shamel T. Janbek and I am from Jordan / Na’ur. I am now residing in Australia. I am very happy to see so many many of the Janbek family on-line. Please look me up on facebook and lets stay in touch. Personally I don’t have details of we got to Jordan and if we have family members outside of Jordan. It would be great to reconnect. Hi to all of you . My name is Tayseer tahir hasan janbek.I live in amman jordan.My father was born in 1890. they lived in tawfeekiya village/Biga/Turkey. My uncle Ismaeil Hasan Janbek was 8years younger than my father. In 1910 my grandfather with his family moved to jordan. I visited Biga this year but could not find any information. My grandfather got maried in a town called Penegkoy/russia.Any infomation about this matter shall be highly appreciated. Hi all of you, Am Hoda Zaki, am Egyptian, my grandmother is Madiha Ramzy, the daughter of Aly Ramzy Janbek. In Egypt, there a lot of Aly Ramzy’s grandchildren. i am looking forward to exchange informations with eachothers and to stay in contact.